…and, no, I haven’t seen that movie. So, once again the Mets are making a myriad of poorly thought out decisions. The maddening fact is that comparing several of them displays a shocking amount of contradiction. 6. Gary Matthews Jr. CF SERIOUSLY? In terms of power and hitting ability, Bay is the best player the Mets have, so clearly he should hit fifth behind Mike Jacobs. Then you have GMJjr at CF who is no longer anywhere near the player he was that one season. The Mets have a better option in terms of offense and defense in Angel Pagan, but GMJjr had the better spring training (and that means everything). Pagan could be slotted into the lead-off spot where he saw some time in the past (.316 .358 .508 in ’09) and, despite not being the best player for the job, he can still produce effectively. Oh, and Cora went .207 .310 .253 batting 1st in ’09. Mike Jacobs was so bad in 2009 that he was dropped by the Kansas City Royals. That alone should be proof of his ineffectiveness. Jacobs broke out in 2005 with a stellar 30 game run putting up a line of .310 .375 .710 and 11 HR. Since then his OBP has dropped each year to .297 and his K totals have risen to 132. 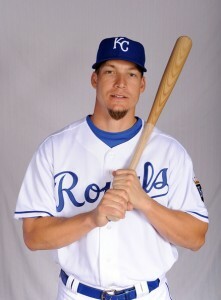 In 2008 he crushed 32 HR and SLG .514, yet also hit .228 and OBPed .299. And KC dropped him because he sucked so much. But Jacobs has MLB experience, which apparently counts for a lot in the Mets’ world. Meanwhile the Mets have Fernando Tatis who also has MLB exp. and who they apparently want to platoon with Jacobs (Jacobs vs RHP, Tatis vs LHP). Jacobs vs RHP = .263 .325 .505 (vs LHP .221 .269 .374). Tatis vs RHP = .264 .343 .439 (vs LHP .272 .351 .457). So all that Jacobs offers over Tatis is more power against righties and an agonizing lack of defense. In 574 games in the minors Jacobs put up a decent line of .287 .344 .471 and very little of that occurred at AAA (27 games). The Mets have two 1B candidates in the minors who also put up incredible springs before the Mets tired of this and gave the rest of the ABs to Jacobs so that he could convince them he wasn’t worth the agony (he sucked, but the Mets were able to look past that, so contradictory point #1). Ike Davis got off to a slow start in 2008 before blossoming in 2009 and has a career of .284 .363 .458 in 172 games. He hasn’t played above AA and therefore should enjoy a 2010 in AAA, which the Mets rightfully decided. Chris Carter has spent far too long in the minors and while he has the versatility to play OF and 1B he also lacks a little defensively, though not as much as Jacobs. In 726 minor league games he has gone .306 .380 .510. He hasn’t failed to produce at any level and while one could expect a reasonable drop-off in those numbers in the majors it would still be a damn sight better than that fuckwit Jacobs. Your new lineup and batting order that you will never see with Manuel dicking around: Angel Pagan CF, Luis Castillo 2B, David Wright 3B, Jason Bay LF, Jeff Francoeur RF, Chris Carter 1B, Alex Cora SS, Rod Barajas C, Johan Santana P.
The Mets have also produced massive amounts of fail with respect to their pitching decisions. They are essentially entering the season with 7 starters in their ranks. Johan, Mike Pelfrey, John Maine, Oliver Perez, and Jon Niese will be the rotation while Fernando Nieve and Hisanori Takahashi will twiddle about in the bullpen. Joining them will be Pedro Feliciano, Ryota Igarashi, Francisco Rodriguez, Sean Green, and Jenrry Mejia. Kiko Calero and Nelson Figueroa were both sent to AAA, with Figueroa being exposed and most likely taken through waivers. This equates to massive stupidity. The Mets pitchers in general had horrible springs with Mejia being the exception. Figueroa also had a great spring with one horrendous start marring his numbers. Mejia is like Ike Davis in that he has two years of minors experience and has never appeared above AA…and so we reach contradictory point #2, because despite needing time in the minors he won’t be there. Mejia is a starter, at least in the minors that was how he was being developed. He has a good fastball, but needs to develop his secondary pitches to the major league level. Stunting development through needless bullpen use is a good way to destroy a promising career. Sometimes it works, but in the case of Johan Santana he had 3 years in the minors and the couple years of relief in the majors probably lengthened the time required to develop those extra pitches. It’s been argued that Mejia’s promotion is an attempt by Omar Minaya and Jerry Manuel to save the careers in a “win now” mentality. If that’s the case, why do we have Jacobs and Matthews? And there is contradictory point #3. Sean Green was bad in 2009 and he was bad in spring training. He can be optioned to the minors. Calero was signed to a minor league contract, but he has a proven record of MLB success. Niese and Nieve both have options. Figueroa is dependable, has no options, and on many days will be a better pitcher than portions of the Mets rotation (almost anyone is better than Perez most of the time). It pains me to say this, but I may have to hope the Mets tank the beginning of the season in order to bring about an end to the Minaya/Manuel regime. 2011 anyone?